The remarkable story of a lad from the Rhondda Valley who rose from the rank of Sergeant Pilot to Air Marshal receiving the DSO, three DFCs, an AFC and other decorations along the way. He completed three tours of operations over enemy territory including thirty-one extremely dangerous low level attacks on enemy targets from the beleaguered island of Malta. This is not only the story of a skilful and courageous pilot but also relates Sir Ivor’s varied and interesting post-war life. In 1955 he set a new speed record flying from Canada to England in a Canberra bomber, became Commandant of CFS which included the management of the Red Arrows and he commanded No.11 Group at the height of the Cold War. 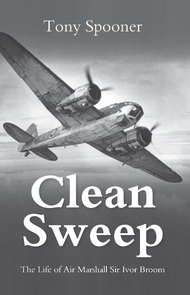 Clean Sweep provides a fascinating glimpse of RAF life through some of its most eventful years.